Last week I got round to one of those jobs that I’ve wanted to do for a while and that’s making my affiliate links a bit more visitor friendly and readable. I’ve mentioned before how I automatically convert links to sites that I have a relationship with to their corresponding affiliate links, I’ve now taken this a stage further and have created a Word Press plug-in to make it easy to add new affiliates as I find them. As you can see the affiliate link is pretty darn ugly and to the (slighty) trained eye it is obviously an affiliate link which does put some people (especially tech savvy webmasters) off clicking it. Which would then display like: My Affiliate Link, normally when you hover over a link the URL appears in the status bar at the bottom of the browser by using the onmouseover and onmouseout you can control what is displayed in the status, so instead of displaying a long affiliate code you simply show the original URL. Unfortunately this only works in IE, in FireFox nothing is displayed which will also put some people off from clicking (the example link will not demonstrate what I am explaining as Word Press strips the code). The solution that I implemented last week was to convert all relevant outgoing links to an internal link that will automatically forward to the affiliate offer. So instead of having a mega long affiliate link that I can only hide from some browsers I now have what I think is a much more friendly status bar link so clicking here will take the visitor to my og.php (outgoing) page which then forwards them to the appropriate offer. The next part of the project was to code the forwarding page, which forwards the regular URL to the affiliate page. I won’t go into how this works as it’s just a simple coding exercise that is out of the remit of this article. I have however created a quick and dirty plug-in (I think all my plug-ins are quick and dirty) that you are free to use on your own WordPress blogs. To use simple download st_auto_affiliate_links.zip, unzip and upload the files to your plugin directory. Once the plug-in is activated you will have an options page where you can enter before and after URLs. I’ve created a few default affiliate converters, which you can change to suit. This seems much easier than having to code my own so I think I will try it out. Thanks for the plug in. Excellent for sharing. I’ve just downloaded and uploaded – running live now. How did you configure the ThinkGeek code for your affiliate number – I’m searching in CJ but not getting it. The way I did it was to create the link in the CJ control panel and then dissect it to see which bit did what, if that doesn’t help post again and I’ll see if I can explain it further. In the past I’ve had problems with TradeDoubler not tracking the header("location: $lNewURL"); URLs correctly. If you use TD, I recommend you see if the header() function has any negative impact on your earnings. On a side note, the title “Automatically Increased Affiliate Revenue by 15%” is not explained further in your copy (although I think that the new URLs will improve earnings by 15%). I would prefer a title like “Disguise your afilliate links in both Firefox and IE”. Your right Andreas that would of been a better title, I think when I wrote this post I had my coding head on so didn’t really go into the stats. The 15% was a bit of a gestimate, I have seen increases but I can’t guarantee all were down to the new links, seems to be worth doing though and it also makes it really easy to add new ones in the future. It’s interesting that there is almost always this “jealousy” thing. You do your research, spend time and money to find something useful and people don’t want to click on the link since they know you’ll make some money. And once you hide this (as you did) visitors are more inclined to click through and make a sale for you. Thanks Al. I’ve been looking for something like this for awhile now. I’ts nice to see you doing these things to gain a couple of points on conversion. After a very long time of rebuilding our online businesses data/base where I work I’m now getting to spend most of my day looking at things like this now. which then redirects straight to the affiliate page. I use the Redirection plugin for this. Makes life SO much easier. There’s a proper admin page, with logging to see how many times a link was clicked, and what the referring page was, etc. 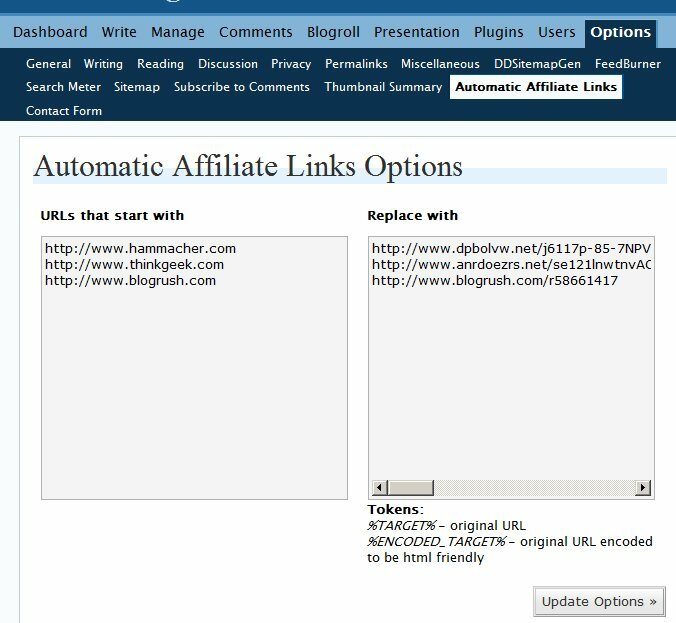 Very helpful for masking affiliate links as well as finding incoming links that are incorrect via the 404 log and setting up redirections to fix them. I’ll definatly use this plug in from now for any aff links I have on my blog. It’s under 24 hours old and there’s already a new version. The previous one didn’t cope with paramters the new one does so just upload again. I put that in the ‘replace with’ box and then place http://www.gftforex.com into the ‘urls that start with’ box.. Thanks in advance for any tips to ease my brain damage! If you want to convert URL xxxxx into URL yyyyy you are right that you do not need to use the %target% or %encoded_target% param. You only need to use this if the source URL is contained in the target URL. Where the tag is your affiliate ID. I was unable to get the affiliate links to cloak. This site is using a database fed dynamic php script. The product url’s go to http://www.aquariumsdirect.com/…..(long line of product id info and affiliate id). Can you please help me with this. Just let me know what info you need to explain the problem or what is keeping it from working. This is a great time saver and I love the cloaking frature. This does not work however. How do I handle deeplinks with url parameters ? Actually, there are several plugins that do what you want, Pretty Link is one.It also tracks clicks on the link. You could also have created a directory containing the default file to change the header to the link you want, then just address it as domain.com/directoryname. Here is a link that uses Pretty Links plugin for WordPress. Can you guess where it leads? It is nested 4 directories deep. Well since reading this post 2 years ago, I decided that I wanted to create something similar for http://www.domainleft.com/ where if you wanted to register a domain you simply go to http://www.domainleft.com/geturl.php?domain=domain.com and then it transfers you to godaddy! I have to agree though, since implementing this page, sales have gone up!!! I think at the time it was a good idea! and not very common. Now adays, there are plenty! Credit should be given for the initial spark tho!